Nintendo put a great deal of thought into the design of the Switch with the exception of the alternative Pro Controller, which feels like an afterthought. It might be official, and a perfect way to play Nintendo Switch games on a TV, but it comes with a steep price tag, and a bulky design that flies in the face of the Switch’s best feature: portability. So I’ve been on the quest to find an alternative controller more in line with the Switch. And I’ve found it. If you need a controller that can be easily thrown in a bag but doesn’t feel as horribly cramped as a detached Joy-Con, 8Bitdo’s NES30 Pro strikes a perfect balance. The NES30 Pro has actually been available for a while now. It uses Bluetooth to connect to laptops, tablets, smartphones, and other devices that can play games, but don’t come with their own dedicated controller. In May the company updated the firmware for all of its controllers, which added support for the Nintendo Switch. How to get an 8BitDo controller working with the Switch. Pairing the NES30 Pro with the Switch isn’t quite as simple as it is with Nintendo’s controllers, but it’s hardly complicated. Once you figure out where you need to go in the Switch’s slightly confusing settings (Controllers > Change Grip/Order), it pairs quickly. The NES30 Pro is only slightly larger than a Joy-Con, but it includes all the functionality of the Switch Pro controller. In terms of size, 8Bitdo’s NES30 Pro falls somewhere between the Switch’s Pro controller, and a detached Joy-Con. But unlike an individual Joy-Con, the NES30 Pro includes every button you’ll find on the Switch Pro controller. I was able to do everything I could think of on the console, including accessing the Home menu, and taking screenshots, after some quick trial-and-error. The only thing missing on the NES30 Pro is motion controls, which I tend to rely heavily on for archery in Breath of the Wild. You’ll have to get used to having your shoulder buttons sitting side-by-side on the NES30 Pro. My biggest complaint is with NES30 Pro’s button placement. In an effort to keep the controller small, the buttons have been shoehorned onto the device in often inconvenient ways. For example, the shoulder buttons pairs are side-by-side on the controller’s top edge. If you’ve already put a lot of hours into Breath of the Wild, you’ll need a little time to re-train your muscle memory and get used to this alternate control layout. That said, the buttons and joysticks themselves all feel fantastic, with satisfying clicks and responsiveness. The controller’s hardware feels like something Nintendo made, which is probably the best compliment I can give it. The other problem I had with the NES30 Pro is more of a trade-off. The thing is very compact in size. Playing with it doesn’t feel anywhere near as cramped as a single Joy-Con controller in hand does, but gamers with larger paws might find the NES30 Pro a little uncomfortable for longer gaming sessions. If comfort’s your priority, the NES30 Pro can’t compare to the Nintendo’s Switch Pro controller, which seems to just perfectly melt into your hands when you pick it up. 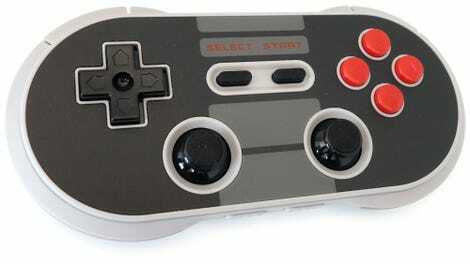 Larger hands will find it a little cramped, but for everyone else the NES30 Pro is the perfect mobile controller. But what it lacks in comfort, the NES30 Pro more than makes up for with a cheaper price tag (that’s easier to justify when you factor in the fact it works with other mobile devices too) and a design that perfectly balances size vs. functionality. They say the best controller is the one you have with you, and the NES30 Pro is easy to slip into a bag alongside your Switch, so you can recreate all those fun on-the-go gaming opportunities Nintendo teased us with, without having to suffer with a tiny Joy-Con in hand. The NES30 Pro’s button layout is slightly different than what you’ll find on the Nintendo Switch Pro and the Joy-Cons, which will require some muscle memory re-training. Its cheaper (£28.50) than Nintendo’s official Switch Pro Controller (£59.99). It’s tiny, and gamers with larger hands will definitely find it a little cramped to use. No motion controls to assist with aiming in Breath of the Wild. The NES30 Pro’s tiny joysticks have less travel than the joysticks on Nintendo’s controllers do, making them feel a little over-responsive. 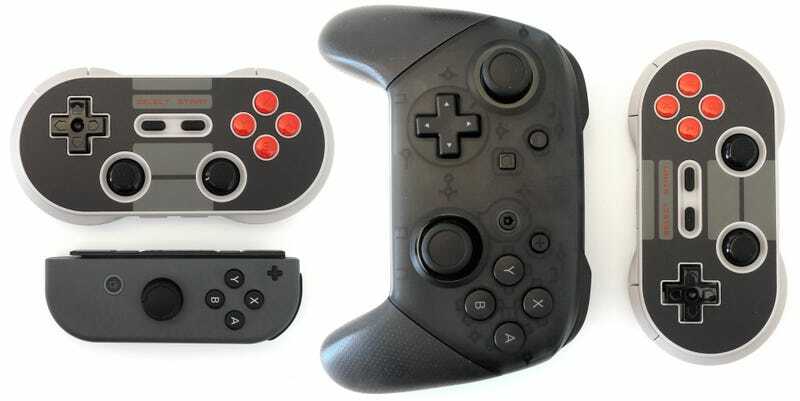 The controller also connects to Android, OS X, Windows, and most devices that support a Bluetooth controller.